This book is really hard for me to rate. It's not bad, but I didn't love it. I took quite a few chapters to get into the book, and I think it's because I had very different expectations of it. 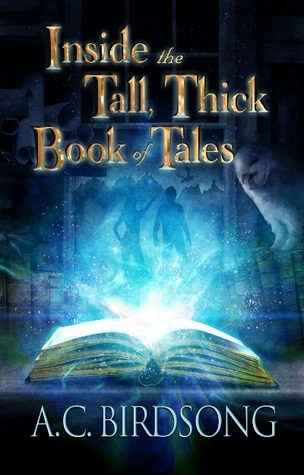 Since the title is called Inside the Tall, Thick Book of Tales, I was expecting more interaction with the characters in said book of tales. And of course, it was when the characters appeared that I started to get an interest in the book. The characters are pretty unique (Merlin, Queen Gwen are some characters that I did not expect), and their conflict with the bookworm was my favourite part of the book. Sadly, they're limited to the subplot, and don't really affect the main plot of Jacob and Lucy trying to get out. Jacob and Lucy are the two main characters, and at first, I thought it was going to be a cute old-man and small-girl team. But, through some magic, they both became roughly the same age. At the start of the story, Jacob is the caretaker of magic, and he's trapped in the book by his greedy assistant Palmer. Lucy was sent there because she went to visit Jacob and got a bit too nosy. Palmer. Oh Palmer. I don't know what to make of him. Apprentices are supposed to be chosen carefully, but from the start, I could see that he was the wrong choice. And for someone who's inept at magic, I'm amazed that he managed to trap Jacob and Lucy at all. All in all, this is a decent book, and if I didn't expect more interaction with a fictional world (bookception!) I would have been a lot happier. Since the focus is on Jacob and Lucy getting out of the book, I was a little disappointed, but if I didn't expect that, I would probably have enjoyed the book a lot more.